You are at:Home»Must to see»How many days to stay in Hoi An? 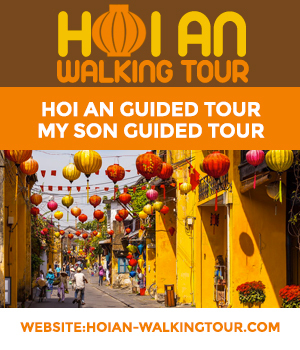 I meet a lot of tourists who only stay in Hoi An for a day, either because they think there is only the old town of Hoi An to see and its Japanese pagoda bridge, or because they have seen on some blogs or forums that the city was too touristy or a tourist trap. Be aware that yes, Hoi An is touristy but this is quite normal as the city is beautiful. You don’t hear people complaining about Paris which is even more touristy … Hoi An remains one a favourite destinations for tourists. Another point to note is that the city is completely free, despite what some blogs may say. The city is fortunate to have two UNESCO monuments: The Old Town of Hoi An and MySon, the Cham sanctuary (1 hour 30 mins from Hoi An). The ideal time to visit is between 6 am and 8 am when the shops are closed and there are no tourists. You will see the magical atmosphere that comes from the city. The old town is not big and you can also buy a pass for 120.000 VND to visit 5 monuments in the city (Pagodas, old houses as well as much more). To do all this, it should take a couple of hours in the morning. Hoi An’s countryside is full of places to see like Tra Que, the largest ecological village in Vietnam. You either have to come early around 5 in the morning or from 4pm in the evening. Between these 2 times, you won’t see many gardeners working as it is too hot. I also recommend the Water Coconut village where you can go on a basket boat in the middle of coconut trees immersed in water. Why not learn how to fish like the locals do at the same time! For all this, it takes an entire day. If you find Hoi An too touristy, I recommend going to the island of Cam Kim (accessible via a bridge) with its unspoiled local life as well as its bamboo and floating bridges. As mentioned at the beginning of this article, I also recommend visiting MySon, a set of Cham temples and possibly the Cham Islands (Cu Lao Cham in Vietnamese) if you like diving and trekking. Apart from these amazing sites to see, there are so many things activities to do such as shopping which remains the most popular thing to do in the city. You can also learn how to cook with the many culinary classes offered in the city or simply go for a ride on a bike. As you can see, staying only one day in Hoi An does not allow you to see everything. This is why I recommend staying in Hoi An for a minimum of 3 days if you want to feel at ease especially since Hoi An is often in the middle of your trip and it’s also an opportunity to go relax on the beach. You will not regret it because the city and its countryside have a unique Vietnamese charm. There is evidence to this as most tourists coming back to Hoi An stay for 1 week. If you stay an extra day, you can visit the largest bamboo bridge in Vietnam (320m long). You can also do a day trip to the CoTu, ethnic minorities of central Vietnam, which are 2 hours from Hoi An.